[CalArts] – Circumnavigate the globe at the California Institute of the Arts World Music and Dance Festival. This year, The Herb Alpert School of Music at CalArts’ annual festival offers six concerts featuring music from Ghana, North India, Bali, Java and Mexico. One of the first schools in the country to offer degree programs in World Music for performance, CalArts has a history of nurturing traditional and new forms of music from a variety of cultures. Such renowned world artists as Ghanaian dancer Beatrice Lawluvi, India’s Aashish Khan and Swapan Chaudhuri, and Indonesia’s Nyoman Wenten, Nanik Wenten, and Djoko Walujo teach at CalArts, and will perform at the festival. Concert venues are The Wild Beast music pavilion and the Walt Disney Modular Theater (MOD) on CalArts’ Valencia campus. Tickets for concerts in the MOD are $10 for General Admission and $2 for students. Concerts in the Wild Beast Concert Pavilion are FREE with lawn seating. Reservations and Ticket Purchase: www.eventbrite.com. The CalArts African Music and Dance Ensemble, under the direction of Beatrice Lawluvi and Andrew Grueschow, performs traditional repertoire from the Ewe and Dagomba people of Ghana, West Africa. Visiting artist Sulley Imoro, an exceptionally dynamic drummer and dancer from Northern Ghana, joins the ensemble for a family-friendly evening. Come celebrate life through the pulsating rhythms of African music! A concert of classical North Indian music with performances by the CalArts Tabla Ensemble under the direction of Swapan Chaudhuri. Then, two legendary musicians of international acclaim–CalArts World Music faculty members Swapan Chaudhuri, tabla, and Aashish Khan, sarode–will create a unique, transformative musical experience. Specific program content, Raag (melodic mode) and Taal (Indian rhythm cycles) will be announced by these masters from the stage. The CalArts Gamelan Burat Wangi (Fragrant Offering) is an internationally known and celebrated gamelan ensemble directed by the incomparable, legendary duo, Nyoman Wenten and Nanik Wenten. This evening’s program features both traditional and contemporary Balinese music and dance–including recent choreography for the Sekar Jepun and the popular classical dance Legong Kraton. East welcomes West in a concert of exciting new compositions performed by the CalArts Student Indian Ensemble under the direction of Aashish Khan. The second half of the concert features new Mexican music influenced by indigenous Spanish, African and Arabic cultures. Though Mexico is incredibly diverse, (63 languages are spoken), one pulsating rhythm is present at every social event: the cumbia. Enjoy a festive evening as students bring their innovative new works to life. his special free concert of music under the stars is part of The Wild Beast Concert Series. Levitt Pavilions , a national nonprofit dedicated to strengthening communities through music, is the Spring Season Partner of the Wild Beast Concert Series. Join us for a raucous outdoor evening concert as the CalArts World Percussion Ensemble welcomes the versatile, prolific multi-percussionist–London-based visiting artist Pete Lockett–to the stage. This special event also features the world percussion group Hands On’Semble, and other great guest musicians. Bring the kids and picnic on the lawn. This evening concert of traditional and new Javanese music and dance features the Court Dance of Yogyakarta and Mangkunegaran Palace of Central Java. The Javanese Gamelan Orchestra Kyai Doro Dasih (Venerable Dream Come True) performs under the direction of Pak Djoko Walujo and Nanik Wenten (Dance Director). Through the support of the Consulate General of the Republic of Indonesia in Los Angeles, a visiting gamelan with musicians and dancers from Institut Seni Indonesia (ISI) in Surakarta, directed by Slamet Suparno and Rahayu Supanggah, performs a rich dance program drawn from the diverse regions of Java. Photography and painting from ISI Surakarta will be displayed at The Wild Beast pavilion during the concert. And after the music and dance–please join us in CalArts’ Roy O. Disney Music Hall (ROD) for a special performance of a Balinese shadow play, Wayang Kulit , accompanied by still more live music. 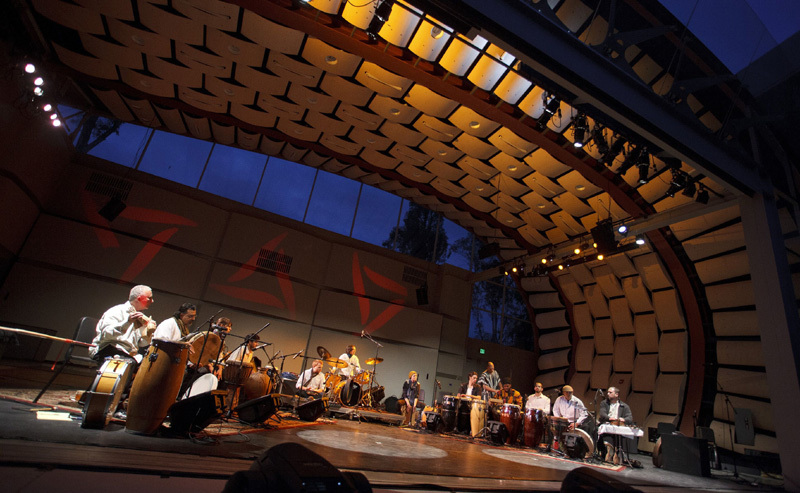 Levitt Pavilions, the Spring Season Partner of The Wild Beast Concert Series, is a national nonprofit dedicated to strengthening communities across America through the revitalization of public spaces and to increasing public access to free live music and the performing arts. Through an innovative venture philanthropy model, Levitt Pavilions partners with cities to develop local pavilions that become coveted anchors of community life. Each pavilion provides a minimum of 50 free live concerts every year by acclaimed and emerging musical artists, offering a rich spectrum of music that celebrates all genres and cultures. There are currently six Levitt pavilions across the U.S., collectively providing free music to over 500,000 people each year by offering 300 concerts in Los Angeles and Pasadena, Calif.; Westport, Conn.; Memphis, Tenn.; Arlington, Texas and Bethlehem, Pa. In the coming years, Levitt Pavilions will develop additional pavilions nationwide, transforming America’s public spaces into beacons of community pride.